The aim of the Observer-Pattern is to define a one-to-many dependency between objects so that when the object on the "one-side" changes state, all its dependents are notified and updated automatically. The Observer/Observable-Pattern is known under many different Names, each flavor is used for a special purpose and has a slightly different form. 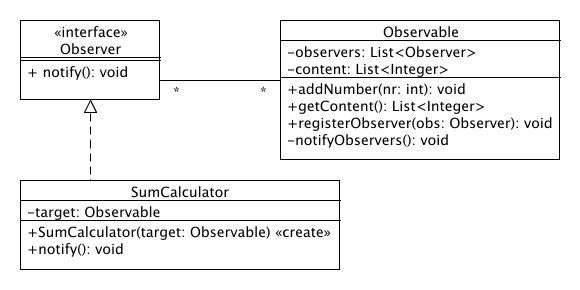 The main idea of the Observer-Pattern is that an object (the observer) that always requires actual data of another object (the observable or subject). The fist solution that comes into mind might be to continuously ask the subject for changes of the data desired and if necessary load the data. The mechanism of continuously asking the subject for changes, also called polling has the main disadvantage of causing an unnecessary high system load. A much better idea would be to delegate the responsibility for informing objects about new data to the producer or manager of the data. Through the producer - in our case the subject - knows exactly when the data has changed and therefore other objects should be informed. This is the Observer pattern. There are basically two ways of notifying the observers: One is the push model while the other is the pull model. The main difference is, that using the pull model the observer has to pull the data needed by itself, while when using the push model the observable sends the data along with the notification. an object should be able to notify other objects without making assumptions about what those objects are. The Observer pattern uses delegation to accomplish its task. Observer is a cornerstone in the Model View Controller paradigm. The Story for this example is the following: We have a Number-Bag which contains numbers (integers) and someone can add a number at any time. But there are several objects which have to know the content of the bag. // on new items in the "Bag"
private List<Integer> content;    // The "Bag"
Every Observer-object has to implement an observer-interface, so that the Observable can notify him. // Register the observer at the target.